Although black widow spiders are not especially large, their venom is extremely potent. The males, being much smaller than the females, inject far less venom. The actual amount injected, even by a mature female, is very small in physical volume. When this small amount of venom is diffused throughout the body of a healthy, mature human, it usually does not amount to a fatal dose. Desert recluse spiders are found in Las Vegas, North Las Vegas, Henderson, and Boulder City, NV and are often mistaken for brown recluse spiders which don’t live in southern Nevada. Their bite is similar to the brown recluse and can have the same affect. 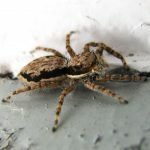 Most bites may require no more than the general spider bite treatment. There may be some localized swelling and redness, but healing can occur without much medical attention. Rarely do these bites cause death. Sun Spiders are sometimes called wind scorpions because of their swiftness and camel spiders because of their humped heads. They habit hot/dry areas so they are commonly found in Las Vegas, North Las Vegas, Henderson, and Boulder City, NV. They use their 2 feelers in the front of their body to chase after warm objects that move such as prey or humans. PEST CONTROLSpiders are actually arachnids, not insects. Spiders don’t bite people very often, but they can be very venomous. Controlling them is of the utmost importance.